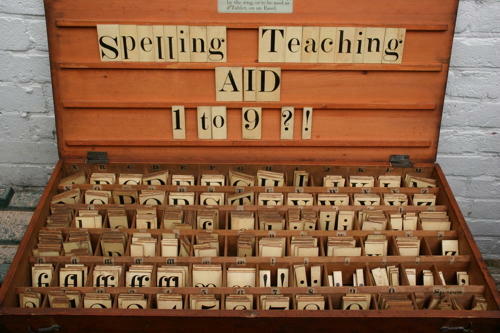 Large and interesting English wooden spelling, punctuation teaching aid c.1900. The detachable lid can be hung on a nail/hook and used as a "blackboard". All the letters, numbers, punctuation and ligatures are painted on thin little wooden blocks. This may have been used in a Sunday School, a small village school and possibly home school/nursery.